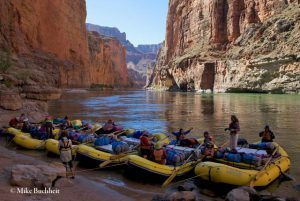 The much anticipated commercial river running season at Grand Canyon kicks off this week in earnest. After a winter spent repairing bones and boats, getting reacquainted with friends and family (spouses included), seeing the world (or just hanging out in Flagstaff coffee houses), the hard working guides that share the depths of Grand Canyon with close to 20,000 passengers a year are raring to get back on the water. Running the Colorado River through the canyon is one of the premier whitewater experiences in North America—one that anchors many a bucket list. There are a handful of outfitters that are licensed by the National Park Service to conduct business in the park. Be sure to budget in a year or two to find a trip that suits your pocketbook, timing, and desired watercraft (oar-powered vs. motorized rafts). As a ten-trip veteran myself, this author can attest to the claims that this is truly the trip of a lifetime.